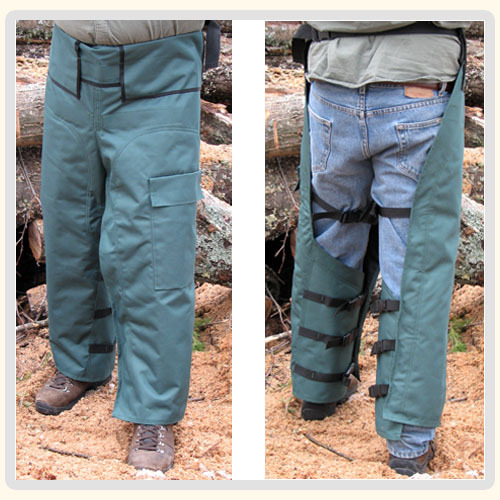 This is the Forester Brand Forest green chaps in Apron or Wrap syle. This listing is for the SMALL only. Other sizes are available on the store. 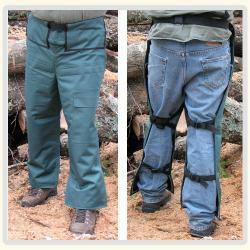 Chaps are designed to protect the entire leg in the most commonly injured areas. 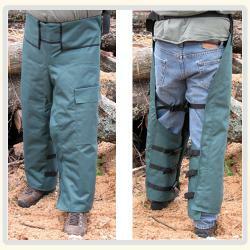 With 12 layers of protection yet lighter weight when compared to other chaps. The 3M ® company makes the Ballistic Fiberglass Mesh material for us. It meets all the new OSHA and ANSI classifications, and they are UL approved. These have a water and oil resistant oxford outer. All our chaps have an adjustable waiste up to 48"
Keep in mind *OSHA / ANSI regulations states that the overall length / bottom of chap must meet ankle joint / top of foot.